The SFSS exists to improve the health and well-being, social, academic, and financial conditions of our undergraduate students. We aim to be an effective voice for our members. Take our survey to tell us which advocacy issues you are passionate about so we can advocate on your behalf to external stakeholders this coming year. On October 9, 2018, our VP External Relations, FCAT Representative, and Environment Representative had the opportunity to present to the Select Standing Committee on Finance and Government Services. This all-party committee is formed to hold public consultation on the upcoming provincial budget every fall following the release of the budget consultation paper by the Minister of Finance. Our SFSS representatives’ presentation focused largely on recommendations to alleviate the burden of housing costs on students. Housing costs in Vancouver are some of the least affordable in Canada, and constitute the major portion of living costs for students. 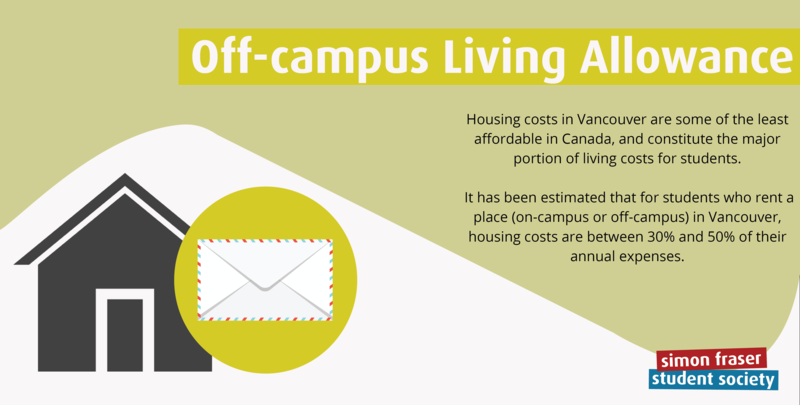 It has been estimated that for students who rent a place (on-campus or off-campus) in Vancouver, housing costs are between 30% and 50% of their annual expenses. As of 2015, 36% of SFU students live away from home. For students living outside of their parents’ home, annual costs of living are on average, 50% higher than those that live with their parents. 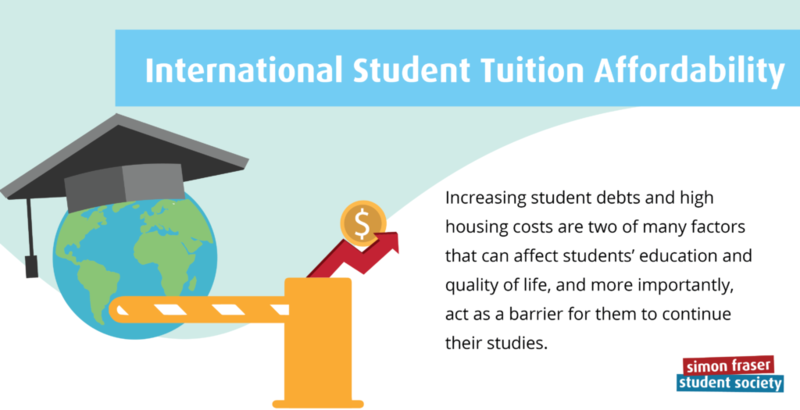 Additionally, international students are more likely to bear higher housing costs than other undergraduate students. The number of international undergraduate students at SFU has increased from less than 900 in 2001, to close to 5,000 in 2017. Increasing housing costs could also be one of the main factors contributing to increasing student debts. 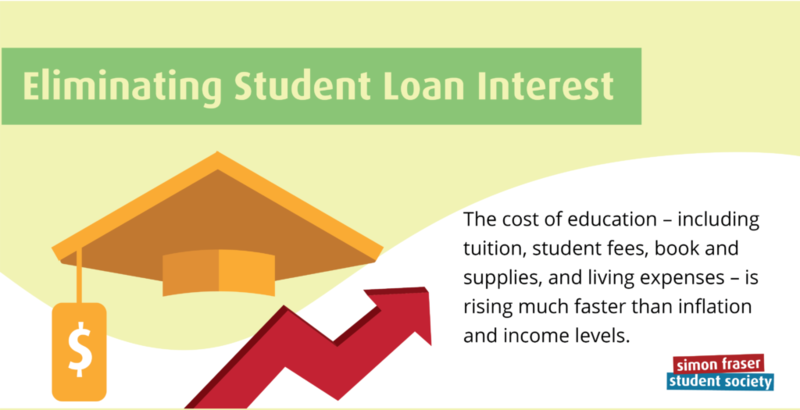 Many students rely on loans and credit lines to finance their education and living expenses. According to Statistics Canada, more than half of undergraduate students complete their study with debt, averaging $26,000 at graduation, compared to an average of $13,6006 in 2005. which would only amount $16,744 in 2018 dollars. During the 2017 provincial election campaign period, one of the commitments of the New Democratic Party (NDP) was to eliminate interest on all current and future BC student loans to ensure low and middle income students can access the education they need to succeed. This commitment comes after a cut on student loan interest rates from prime-plus-2.5% to prime in Budget 2017, introduced by the Liberal government. Budget 2018 does not dedicate funds to meeting the goal of zero interest on student loans. Student loans in BC are comprised of two separate loans: a federal loan and a provincial loan. The two portions together form the integrated student loan – which students apply for through a single process, administered by the BC government through StudentAid BC and then subsequently managed by the National Student Loan Service Centre. Many students rely on loans and credit lines to finance their education and living expenses. According to Statistics Canada, more than half of undergraduate students complete their study with debt, averaging $26,000 at graduation, compared to an average of $13,6006 in 2005 which would only amount $16,744 in 2018 dollars. Additionally, international students pay much higher tuition than other undergraduate students, and annual tuition increases are not capped like they are for domestic students. These students are not eligible for grants or loans from StudentAid BC. The number of international undergraduate students at SFU has increased from less than 900 in 2001, to close to 5,000 in 2017. In 2018/2019, some international students paid as much as $30,328 per year in tuition fees. Based on SFU’s 2010/2011 Budget, tuition at SFU has risen 34% for international undergraduate students beginning their studies prior to September 2017, and 38% for international students who began their studies in Fall 2017 or later in the past 8 years. Comparatively, inflation has risen 14.37% since 2010. For students studying Engineering, Computer Science, or Beedie business, these statistics are even higher. Domestic student tuition increases are capped by the provincial Tuition Limit Policy, while international student fees have no associated provincial funding or regulations and thus fees are set “in the context of the competitive global market”. In 2015, tuition surpassed provincial government funding as the number one source of revenue for SFU, and international student tuition is projected to outpace domestic tuition as SFU’s greatest source of revenue. 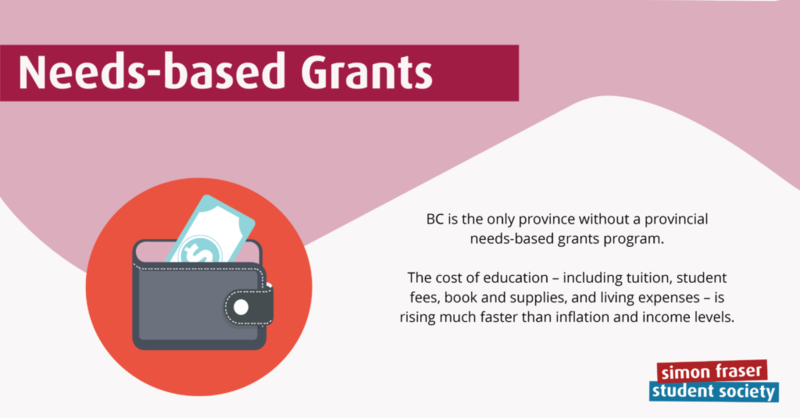 These funding decreases coupled with an increase in tuition well beyond inflation makes post-secondary education in British Columbia increasingly unattainable for foreign students. According to Statistics Canada (2016), more than half of undergraduate students complete their study with about $26,000 debt at graduation. In 2005, this same amount graduated with an average debt amount of $13,600, which would only amount $16,744 in 2018 dollars. This statistic* is likely much higher for international undergraduate students due to international students not being able to access Canadian and BC government loans. 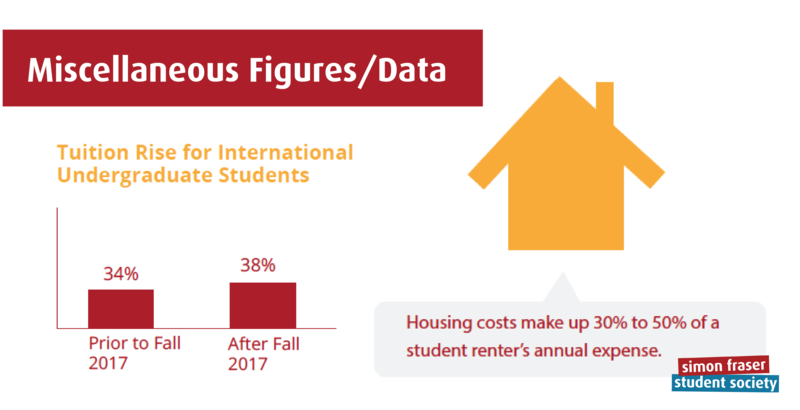 This problem, coupled with the fact that international students are more likely to bear high housing costs and spend, on average, 50% of their income on housing, is troubling. Increasing student debts and high housing costs are two of many factors that can affect students’ education and quality of life, and more importantly, act as a barrier for them to continue their studies. According to Statistics Canada (2016), more than half of undergraduate students complete their study with about $26,000 debt at graduation. In 2005, this same amount graduated with an average debt amount of $13,600, which would only amount $16,744 in 2018 dollars. Tuition at SFU has risen 34% for international undergraduate students beginning their studies prior to September 2017, and 38% for international students who began their studies in Fall 2017 or later in the past 8 years. Comparatively, inflation has risen 14.37% since 2010. According to Statistics Canada, more than half of undergraduate students complete their study with debt, averaging $26,000 at graduation, compared to an average of $13,6006 in 2005, which would only amount $16,744 in 2018 dollars. The result is a significant debt burden on students. The majority of students from middle- and lower-income families need to take out student loans to pay for their education, and these students are more likely to come from marginalized backgrounds. When students who have to take on loans graduate, they often start out in the labour market with huge amounts of debt. 1 out of 5 children or youth in BC live in poverty (families are below the poverty line for their size). Children and youth born to immigrant or First Nations families are even more likely to live below the poverty line. Students from marginalized groups are statistically likely to continue to make less money over their lives in comparison to their university-educated peers. This means that due to the interest rates on student loans, a poor and/or otherwise marginalized student will pay more for a longer period of time for their education than those that did not have to take out loans, or took smaller loans, to pay for their education. Budget 2018 includes a commitment to building more affordable housing by investing over $1.6 billion over three years to build and maintain affordable rental housing in British Columbia. Housing costs in Vancouver are some of the least affordable in Canada, and constitute the major portion of living costs for students. 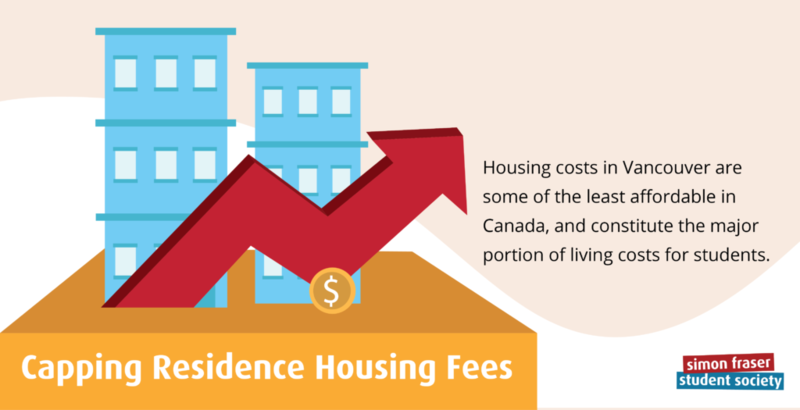 It has been estimated that for students who rent a place (on-campus or off-campus) in Vancouver, housing costs are between 30% and 50% of their annual expenses. Rental costs for purpose-built rental housing in Vancouver has risen by 75% from 2001 to 2017 (Figure 1). The average monthly market rent for a purpose-built one bedroom apartment in 2017 was $1520 in downtown Vancouver, $1171 in North Burnaby, and $908 in Surrey. On-campus, a pre-existing one bedroom apartment is $843 per month. On-campus rents on UBC and SFU Burnaby campus are priced, on average, 25% below the rental market rate for those areas. At SFU, 36% of students live away from home as of 2015. For students living outside of their parents’ home, annual costs of living are on average, 50% higher than those that live with their parents. Additionally, international students are more likely to bear higher housing costs than other undergraduate students. The number of international undergraduate students at SFU has increased from less than 900 in 2001, to close to 5,000 in 2017. Increasing housing costs could also be one of the main factors contributing to increasing student debts. Many students rely on loans and credit lines to finance their education and living expenses. According to Statistics Canada, more than half of undergraduate students complete their study with debt, averaging $26,000 at graduation, compared to an average of $13,6006 in 2005, which would only amount $16,744 in 2018 dollars. Student Aid BC and the Canadian National Loan Service currently offer a maximum monthly living allowance of $1600 for single BC students with no dependents for the 2018/2019 year. This allowance is intended to cover rent, food, local transportation, and all other miscellaneous expenses for the month. This living allowance decreases with income, the length of the program of study, and other factors. Open Educational Resources (OERs) are a solution to ease the financial burden attributed to the high cost of textbooks by offering textbooks in a digital format for free or for a lower cost than print textbooks. OERs can also provide accessible textbook formats for people with disabilities or for those who do not have access to the internet. 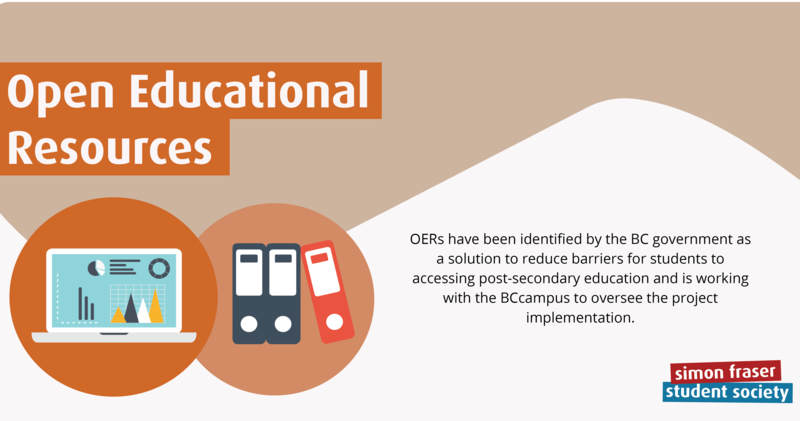 OERs have been identified by the BC government as a solution to reduce barriers for students to accessing post-secondary education and is working with the BCcampus to oversee the project implementation. Create and adapt required ancillary resources, such as assignments and quizzes, to support more textbooks. The Simon Fraser Student Society (SFSS) represents 25,633 undergraduate students attending Simon Fraser University (SFU or the “University”) across three main campuses in Burnaby, Surrey, and Vancouver. In 2018, the UNHCR reported over 68 million forcibly displaced people worldwide with over 25 million of these refugees, largely from South Sudan, Afghanistan, and Syria. In 2017, Canada committed to settling in one million new immigrants from 2018-2020, under the multi-year Immigration Levels Plan. 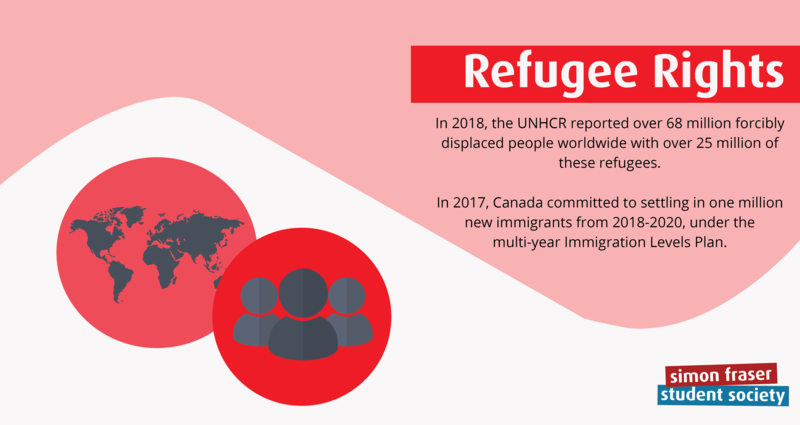 The plan includes the resettling international refugees to approve an estimated 46,000 refugees in 2018 for permanent residence, over 49,000 refugees in 2019, and a target over 53,000 refugees for 2020. Simon Fraser University (SFU) in 2016 created the Refugee Working Group which is responsible for developing and implementing the University’s refugee-related engagement. The group expanded to include newcomers and is now known as the Refugee and Newcomer Advisor Committee (RNAC). SFU is also engaged in The World University Services of Canada (WUSC) which is a global developmental organization that has a Student Refugee Program (SRP). The SRP at SFU has been active since 1981 to sponsor student who have had their education interrupted by conflict to continue their studies in Canada. 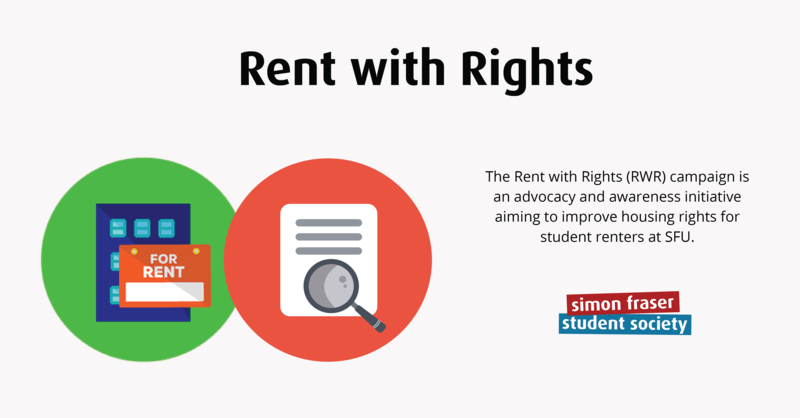 The Rent with Rights (RWR) campaign is an advocacy and awareness initiative aiming to improve housing rights for student renters at SFU. The rights of the student housing tenants should be established and protected to the same degree as the off-campus living students. The SFSS, alongside the SFU Residence Hall Association (RHA), can increase protection and increase rights to student renters at SFU through 9 proposed recommendations to change the SFU Residence License Agreement. The suggested 9 recommendations have been developed in collaboration with the Alma Mater Society (AMS) at UBC and the University of Victoria Student Society (UVSS). 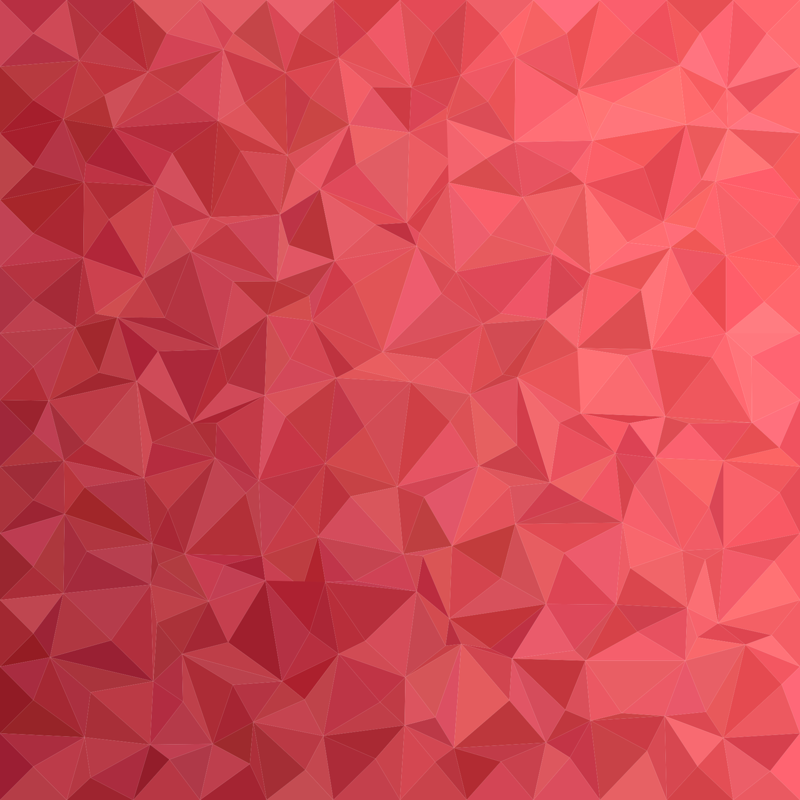 On May 19, 2016, BC adopted the Sexual Violence and Misconduct Policy Act (the Act), obliging all Universities in BC to adopt a policy regulating a standardized response to allegations of sexual violence and misconduct by May 2017. The Act mandates a report on the policy yearly, review of the policy every 3 years, and permits the Minister of Advanced Education, Skills and the Training to request a survey on the efficacy of the policy and procedures at any time. In Budget 2018, the province allocated $5 million towards “Supporting Women and Children Affected by Violence” – however, this budget allocation does not speak to sexual violence or more specifically, campus sexual violence. There are limited statistics on sexual assault on campuses, in part due to low levels of reporting of instances. In Canada, only 33 out of 1000 sexual violence cases reach law enforcement. However, a Canadian survey found that 20% of female post-secondary students, 47% of LGBTQ+ post-secondary students, and 7% of male post-secondary students have been sexually assaulted at some point in their lives. The Simon Fraser University Burnaby Campus is located on Burnaby Mountain, spanning 1.7 kilometres across the top, a mere 700 metres from the Burnaby Mountain Tank Farm (Burnaby Terminal). The Burnaby Terminal is a distribution centre is at the end point of the Trans Mountain (TM) Pipeline System and is an important site for the distribution of crude oil and refined products to local terminals, including the Westridge Marine Terminal which is located at the base of Burnaby Mountain. Burnaby Terminal and SFU campus is separated largely by a forest with two access routes, which intersect at one junction. In June 2018, the modified plan for the expansion of the Burnaby Terminal was approved by the National Energy Board (NEB). 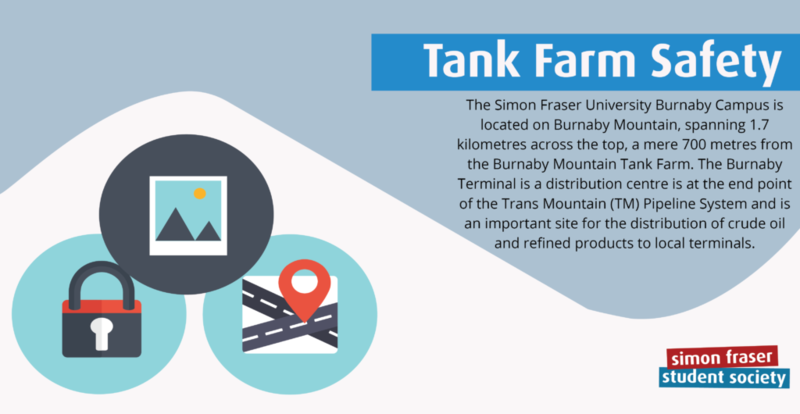 The Burnaby Terminal expansion is part of the larger Trans Mountain Pipeline Expansion project (TMEP) to twin the existing crude and refined oil pipeline from Edmonton to Burnaby. The project will add 14 new tanks and demolish 1 tank, bringing the total to 26 tanks on Burnaby Mountain, located just north of SFU. Increased safety systems, such as full-surface fire protection and odour abatement equipment, will be installed. In May 2016, the NEB approved the Trans Mountain pipeline with 157 conditions. The TMEP, including the Burnaby Terminal, have received considerable backlash from protest groups, the City of Burnaby, and other members of the public, further delaying the construction approval. In May 2018, the federal government purchased the Trans Mountain pipeline to ensure that the pipeline and related infrastructure are built. In June 2018, the NEB approved Trans Mountain’s revised application that included significant safety updates at the Burnaby Terminal and addressed the conditions set out in May 2016. The City of Burnaby requested that Trans Mountain provide a fire evacuation plan for those living and working around Burnaby Mountain before the final approval was granted; however, the NEB deemed the plan not necessary until six months before the Trans Mountain pipeline begins operations. The project at the terminal will begin in late summer 2018. The economic value of investments made into post-secondary education cannot be discounted. Retirements and economic growth are predicted to open up one million job openings in BC by 2024. More than three quarters of the job openings projected for 2025 will require some post-secondary education, with 36% requiring a bachelor’s degree. 83% of post-secondary graduates in the labour force are employed, and only 6% of those in the labour force are unemployed. Investments into education further individual knowledge and skills so graduates can succeed in their chosen occupation. Post-secondary education will allow newly-skilled workers to capitalize on the predicted one million open jobs by 2024 and ensures that labour market needs are met to fill these jobs.